Father Comes Home from the Wars (Parts 1, 2 & 3) is an epic tale of emotional struggle, reconciling ones beliefs, and the torment (and triumph) of love. 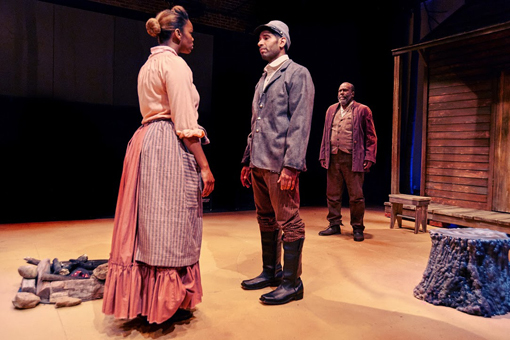 Told in three parts—with two intermissions—each is its own story within the protracted narrative, each story portraying struggles humankind has endured since the beginning of time. In this case, we're experiencing those struggles in the U.S. Civil War. 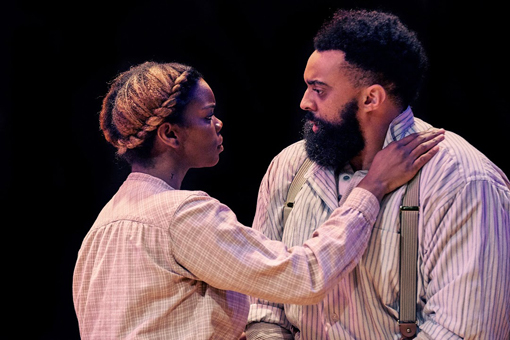 Now showing at Actor's Express through Sunday, June 11, Father Comes Home is by Pulitizer Prize winner, playwright Suzan-Lori Parks, the first African-American woman to with the distinguished award in drama (for her 2001 play Topdog/Underdog). The lead character Hero, who later in the story changes his name to Ulysses, in Part 1 is undergoing a keenly painful struggle trying to decide between remaining with this wife, Penny, which could only be achieved by self-inflicted physical dismemberment, or going off to war with his master—who has promised him his freedom for his service in the war—meaning Hero would have to fight on the wrong side. Evan Cleaver (Hero, Ulysses) is brilliant! I'd seen him perform at Actor's Express before and he was amazing then, but I think he's the stand out in this performance. You feel with him the emotion he's acting on stage—the wide array of emotion—as well as the internal struggle between what his heart is telling him and what he "thinks" is the right thing to do. Brittany Inge (Penny) is equally as brilliant. Her strong presence and strong emotions are beyond evident...they reach right into the viewer's heart, taking them along for the ride. I'd also seen her before at Actor's Express, not so long ago. Her range is impressive and I look very much forward to seeing more of Ms. Inge. Rob Cleveland (The Oldest Old Man) makes his Actor's Express debut in Father Comes Home and it's a performance to be remembered. He's the closest thing to a father that Hero has and he gives Hero fatherly advice, as emotionally challenging as it may be. Later, in Part 3 of the play, there's a highly charged father-son scene that rips your heart out. In Part 2 we meet the Colonel (Bryan Davis, also in The Crucible), who is Hero's master. when he has captured a Union forces Captain. Colonel tortures his prized prisoner physically and emotionally. I think it's the Colonel questioning his own personal beliefs about slavery—owning another human being—and the painful conflict within him that deep down he knows he's not right. He struggles with the actions that have brought him wealth and a place in plantation society, but of instead of relinquishing beliefs I think he knows are wrong, he takes out his pain on Captain Smith (Richard McDonald). Later in Part 2, Hero experiences freedom, but not of himself, nor of his internal pain and suffering. Albeit for a brief shining moment, Hero was a hero. He continues to struggle with what is right, as well as the promise of freedom for his service in the war. In Part 3, we learn of Homer's love for Penny. His love for her is deep and her decision of whether or not to go with him and a band of runaway slaves will seal his heart's fate. It's believed that Hero was a casualty of war when Penny then expresses her love for Homer. Then the plot thickens... But I won't spoil the ending for you. Marcus Hopkins-Turner (Homer), who I'd only before seen in Memphis, is magnificent! His character is strong of will, despite having lost a foot. He's resolve in his love and desire for Penny. Homer was the character I was most most rooting for, but not because he was the underdog. Because he seems to have suffered most of all the characters and yet wields such strength and resolve. It's also in Part 3 when we meet an unexpected character...Hero's dog. The part is wonderfully played by Jason-Jamal Ligon, but expect an internal "reset" from heavy to a bit more light-hearted. While there is humor scattered throughout this otherwise heavy play, "Dog" is delightfully playful, and is wearing quite the clever costume. Actors Damian Lockhart (amazing! ), Meagan Dilworth, and Seun Soyemi portray slaves and, later, other runaway slaves. They are each their own character, with distinct personalities, but their dialogue also serves as a "chorus" to the script, emphasizing certain points made throughout the performance. Parks utilizes a mixture of Civil War era speak and contemporary slang and actions...I doubt you ever saw a 'fist bump' in the Civil War. They're used harmoniously, lightening the gravity of what is otherwise extremely heavy subject matter. Again, this is not a story about the Civil War, it's about human emotion, struggle and internal conflict resolution. Each Part begins and ends with a song performed by the actors, with Part 3 having a little more mixed into its story. Otherwise, this is a quiet play, meaning there's no music during the acting parts. You're mind is accompanied only by the performance taking place before you, which allows for a wholly immersive experience. Theses are only a few highlights. This play goes much deeper. It's an exploration of the battle many of us have experienced...the battle between circumstance and self. Next up is Little Shop of Horrors, opening July 15. 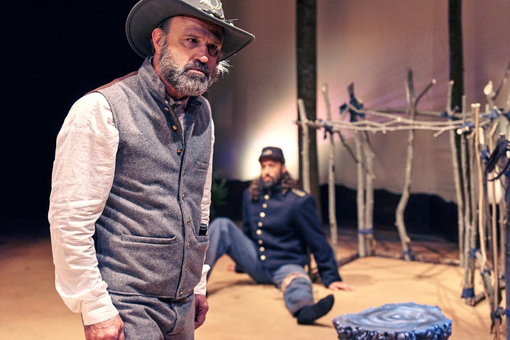 Go see Father Comes Home from the Wars (Parts 1, 2 & 3) at Actor's Express by Sunday, June 11. Know going in that this is a three hour play, with two intermissions, then buy your tickets and go fully immerse yourself in this wholly remarkable exploration.